Otherwise, we’re ready to continue by tackling the tub and shower, including a deep clean for the tile grout. The shower and tub area of your bathroom(s) is prone to collecting all kinds of undesirables. Hair products, body soil, any bath oils you may use, and soap scum all work in concert to conceal any shiny portion of the tub. Meanwhile, corners and ledges act as accumulating regions for mildew. Any misstep in regular maintenance through the year have left quite a job for us in spring cleaning. 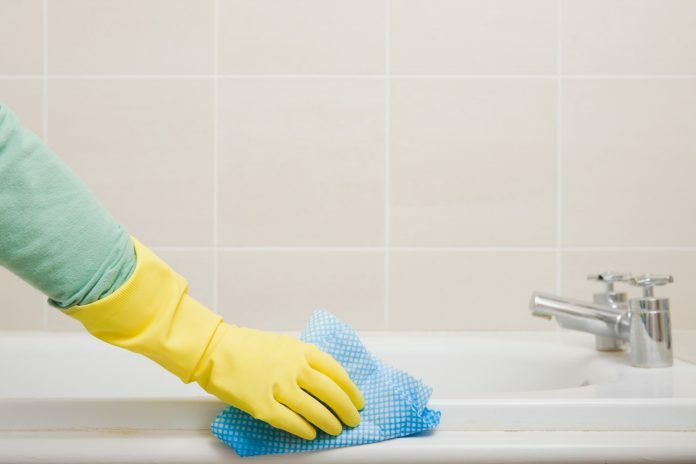 Our goal here should be to restore all of the clean surfaces and remember what areas we need to tackle more frequently in weekly cleans from this point on. Attack and Hold Firm: Whether you have multiple bathrooms or just the one, this is a generally great idea. 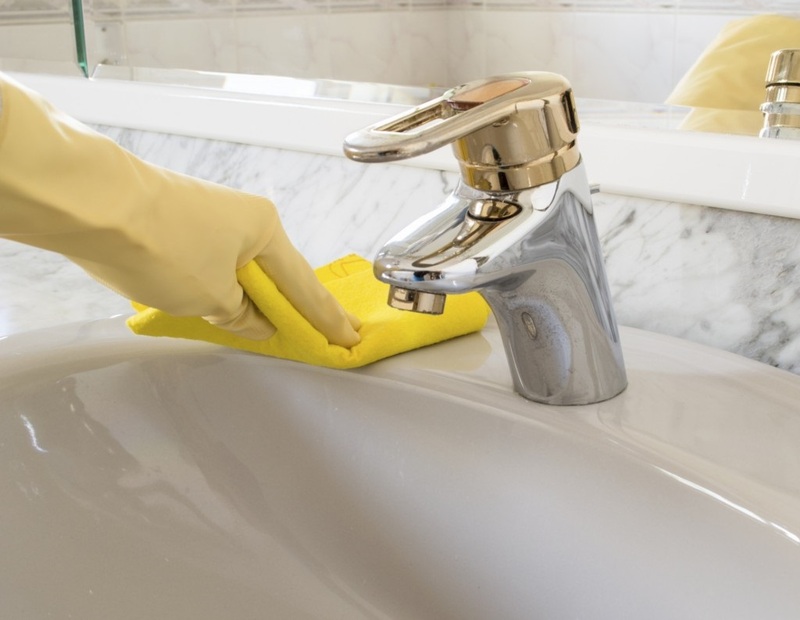 Use your all-purpose cleaner liberally throughout the shower and tub before cleaning any of the rest of your bathroom. Then return to the shower and tub later on. This will permit the cleaner to attach to more residue and give you a vastly superior clean when you are ready to scrub. Return to the Scene: Now that the rest of the bathroom, or majority of it has been dealt with, it’s a good idea to return to the tub where our all-purpose cleaner has been sitting. Rolling up your sleeves and attacking the tile and grout now will yield a lot more fruit with less effort: nice. In order to get tougher corners, make use of a toothbrush. The scummy deposits that have been percolating with the all-purpose cleaner should come up fairly easily. Rinse Down: Rinse the tub and shower walls down, either with a removable shower head, or using a plastic bin to reflect the shower head’s flow around. Get the entire area rinsed, then follow up with a dry rag or paper towels. Wiping down can pick up any remaining grime that was too stubborn for the rinse and would have become a decoration again later. While we can’t solve hard water issues from mineral buildup in your pipes, we can give one of our handy helpful household tips to improve how water emerges from the shower head or faucet directly. You’ll want to mix 1:1 some vinegar with water and place the mixture into a plastic bag. 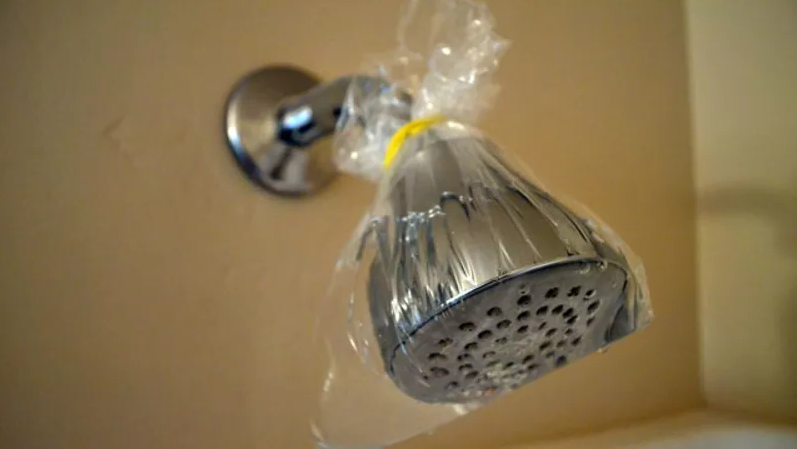 Then wrap the plastic bag right up around the head of your shower or faucet and rubber band it on securely so that it is essentially swimming in the mixture. Leave this on overnight and the vinegar solution should erode a great deal of the blockage. We’re nearly done. At this point, we want to get any loose dust off of our light fixtures (and replace any bulbs if some are dimming). Collected grime should be attacked with microfiber and some vinegar spray. Clean your windows with a softer window cloth or newspaper. Newspaper may seem an odd choice, but it is excellent for picking up stubborn grime. Finally, sweep/vacuum the floor and then either mop or use a Swiffer sweeper. You can get corners of the floor with that handy tooth brush. With the floor complete, we’re ready to move everything back into their respective cabinets. We did it! Mimosa time.